Ever wonder how we became mount experts? A long time ago, being one of the first to get Sirius XM Radio and tired of having our radio plop onto the floor because the sticky tape didn’t hold, we found a mount that attached to the back of the Skyfi cradle that also attached to the car seat bolt. And it just went forward from there. Satellite Radio has come a long way since we sold our first mount. There are millions of subscribers and some pretty cool music and personalities on XM and Sirius. Remarkably though, the mounts are as bad today as they were years ago when our radio plopped onto the floor. There are so many better choices than the dash mount that is provided. Some Sirius car kits include a suction cup mount which is almost as poor as the dash mount. I have owned many Sirius radio systems and whatever you do, don’t use the adhesive dash mount. They won’t last. Today, there are a variety of mounting solutions available for your car, motorcycle, bike or boat. All have one thing in common: they need a car kit to attach to. A lot of customers are hoping otherwise, but the car kit and accompanying cradle, antenna and power are needed to attach to any mount. Most XM Radios have a slot on the back and the mounts have a T that fits into the groove. Most Sirius Radios have a 4-hole mounting pattern on the back of the cradle (called an AMPS mounting pattern). So you need to ensure that the mount that you purchase can accommodate the pattern on the back of the cradle. A popular mount for satellite radios remains the Car Seat Bolt Mount for Sirius XM Radio. That’s the one in the photo that accompanies this article. This attaches to the bolt on your seat bolt. A lot of people ask us if our mount will fit their car model. Our answer is always the same: if the seat bolt is exposed these ought to fit fine. But just in case the bolt isn’t exposed, we include hardware to attach it right to the floor. These are the sturdiest mounts around for satellite radios. It sits at the perfect height for you to switch stations and see the display. I have personally used on of these for many years. Installation takes five minutes and the mount will last longer than the car itself. I have removed this mount from two cars which I have traded in over the years only to install it again in another car. Another popular mount is the Car Cup Holder Mount for Sirius XM Radio. These mounts fit the back of your cradle just like the floor mount. Depending upon where your cup holder is located, these may sit an even better location than the floor mount. These are the easiest to install. The bottom is expandable so that it can contour to almost any size cup holder. We find these work in all vehicles except those with pullout cup holders. My MDX has pretty big cup holders and they fit real well. Next, consider the Car Air Vent Mount for Sirius XM Radio. As long as your vent mounts are horizontal, these should fit fine. We find they fit most cars except Pontiacs and some Lexus models which have either circular or vertical vents slats. Satellite radios aren’t very heavy so don’t worry too much about damaging your vents however do check to make sure that your vents are stable and aren’t already coming apart. Lastly, the old school Car Windshield Mount for Sirius XM Radio is still around. 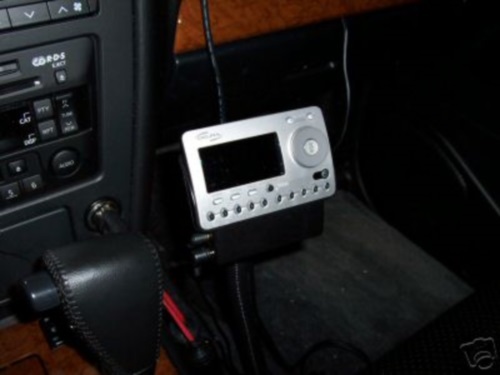 A good mount that was the only choice when XM Radio was first introduced. Now with so many other alternative locations, this isn’t as popular any longer but people still buy them. The positive on this mount is that it’s in plain view. The negative is that some states do not permit attachment to a windshield. If you live in California or Minnesota, be sure to read our article on that topic.